Above: Family and friends. 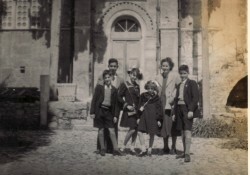 Standing are: Grigorios Geragotellis, Panagiotis Pitsiladis, her husband, Dimitrios, Pelagia herself; her daughter, Mercine; persa Zaloume; and her sons, Georgios and Ioannis. 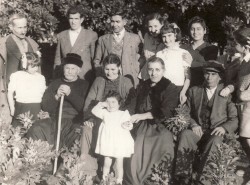 In the front row are: her daughter, Nitsa; her parents, Georgios and Amerisouda; Myrsini and Grigorios Zaloume. The young girl in the front is Kiki Pitsiladi. 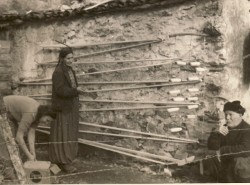 Above Right: Her mother, Amerisouda, at work, while her father, Georgios, is on the right and her sister, Persephone is on the left. 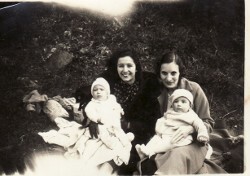 Above: With Dimitra Andonarou- holding her son, Stan. Pelagia is on the right- holding her son, Ioannis. Above Right: Family and friends. 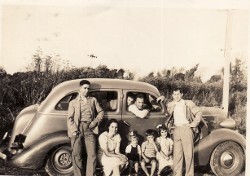 L-R: her husband, Dimitrios; Pelagia herself; her children, Nitsa, Georgios, and Mercine; and Georgios Andonaros. In the driver's window are her brother, Apostolos and her son Ioannis. Above: With her husband, Dimitrios, and their children, Georgios, Mercine, Nitsa and Ioannis.